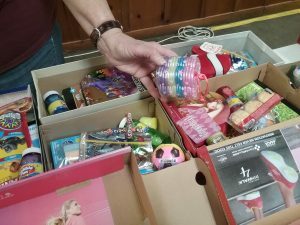 In a project started several years ago, Outreach Board at First Congregational Church collects craft supplies, games, toys and snacks for Spring Break entertainment. 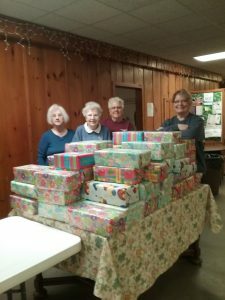 This year 74 shoeboxes were packed and wrapped by six volunteers. These boxes have been delivered to Siren Eaton Shelter and Eaton Clothing and Furniture Center for distribution to qualifying families to enjoy during Spring Break. Last year there were 60 boxes; each year the project grows!